Mr Norman Mackay came on to the Borough Council at a by-election in 1978 and in 1980 came to the mayoralty unopposed, and was the mayor of the Centennial Year 1981. This was the year that the new Borough Office was built to replace the brick Patea Town Hall, which was demolished not long after. 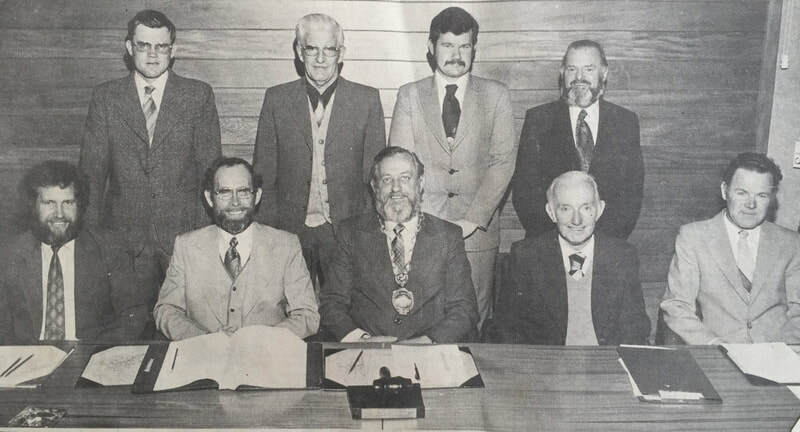 He remained Mayor of Patea until it merged with the South Taranaki District Council in 1989. Mr Mackay was born in Stratford in 1932. His grandfather came from Scotland and his father was born in Hokitika and came later to work at the dairy factory at Ngaere. In 1940 the family moved to Patea. Norm was educated at Manaia and Patea Primary Schools and Hawera High School. After leaving school he worked for a couple of years at Farmers’ Co-operative and in forestry and then took up permanent ernployment at The Patea Freezing Works from 1950 to 1980. Starting out driving the 'small goods' van, delivering produce all over the lower North Island, then in the Wool and Skin Department as a wool puller. In 1955 Norm married Ruth Shaw from Manaia. The met at a dance at St Joseph Hall Hawera and the following week their first date was to a dance at the Kakaramea Hall, where Norm gave Ruth a ride back to Hawera on the back of his motorbike. After a 6 month engagement, they were married. They went farming for a year at Auroa in 1957, then came back to Patea and built a house on Kent St (now caretakers house next to the School) They sold that home in 1969 and together they owned and ran first the dairy at the north end of town, and then 3 years later bought the bookshop on the corner​ of Richmond Street. In 1992 they sold the Bookshop and retired to 177 Egmont Street., although neither of them stopped civic and community work. Ruth is a talented singer and dancer which she taught for a while and involved in fashion and modelling. She was a founding member of Rebekah Lodge in Patea, Organizer of at least 3 Patea Miss Spectacular's, and was on the Patea High School Board for 12 years. During the 9 years Norm was Mayor, they entertained various dignataries including the Govenor General Sir Paul & Lady Reeves, the Dutch Ambassitor, and numerous Politians during the time of the closure of The Freezing Works. Norm and Ruth have 6 children, Cheryl, Wayne, Linda, Ashley, Adrian & Brendon. Viberant and energetic; Ruth is in the middle of her second term on the Patea Community Board and is currently (2018) the Chairperson at the age of 82, a position Norm held in the 1990’s when the Community Boards were set up after the Council merger. ​Norm held various positions and interests in the town including President of Patea Businessmen’s Association and was on the Board of Management of the Presbyterian-Methodist Co-operative Parish. He was a life member of Jaycees, was a member of the Primary School Committee and was chairman of the School Centennial Committee. For over 20 years he was associated with the Patea-Waverley District Pipe Band and in sport he took an active interest in the Rugby Football Club and the Amateur Athletic Club. Norm guided Patea through its darkest days after the closure of the Patea Freezing Works in 1982, and worked hard to establish employment possibilities for the hundreds that lost their jobs and lively hood during that time. Norman died at the age of 75 on 24 June 2008 and is buried at the Patea Cemetery.